Does your company waste countless gallons of fuel, and ultimately money, because you need to keep your TMA truck’s engine running to supply power to the truck during stationary operations? By installing a truck mounted generator to your truck, not only will your company save significant money in fuel consumption but also will save your engine in the long run, while keeping your company legal and ethical. What is a Truck Mounted Generator? Before we get to the benefits of adding a truck mounted generator to your truck, we need to address exactly what it is and how it operates. As was previously stated, if your truck is not outfitted with a truck mounted generator, you would need the engine to be on in order to power the auxiliary lights and other accessories. In highway construction operations, TMA trucks are often left idling for full eight-hour shifts. Since the engine needs to be kept on in order to power the necessary lights and equipment for the work zone, the truck can burn between a half-gallon and a gallon of fuel per hour. Needless to say, the cost of fuel consumption from idling quickly adds up. That’s where the generator comes in to save the day (and your wallet)! If your truck is outfitted with a truck mounted generator you can power all the lights and equipment you need via the generator without having to keep the engine running. Unlike the engine which uses between a half-gallon and a full gallon of fuel per hour when idling, the generator only uses 1 gallon of fuel per 6 hours to power the truck’s lighting and accessories. Over the course of a year, the savings from fuel consumption quickly add up. Using the national current average price of a gallon of diesel of $4.85 (as of 7/12/18), you can see that using the generator will save your company significantly. The cost difference in fuel consumption from powering the truck’s lights and accessories in truck with and without a generator. As you can see, you can save over $8,000 per year in diesel consumption by adding the generator to your truck. Do you know about your truck’s diesel particulate filter, or DPF? The Environmental Protection Agency has mandated that all vehicles with a diesel engine built after January 1, 2007 are “required to reduce nitrogen oxide (NOx) emissions by 50 percent and particulate matter (PM) emissions, also known as soot, by 90 percent, relative to the 2004 standard.” To meet these standards, diesel particulate filters have been installed on trucks to help clean exhaust gases from the engine. In essence, the DPF operates as a filter, trapping dangerous particulates in the filter while allow safe exhaust gases to escape. How do I maintain a DPF? Your DPF requires regular cleaning. Over time, the trapped soot accumulation overwhelms the engine and actually causes it to underperform. To combat this, the diesel particulate filter needs to be regenerated, otherwise known as the re-gen process. When the truck reaches exhaust gas temperatures (EGT) of between 1,000 and 1,100 degrees Fahrenheit, the engine can passively regenerate the diesel particulate filter. According to Waste Advantage Magazine, “For most highway-driving vehicles, the EGT required for regeneration is created naturally under normal operating conditions and a ‘passive’ regen occurs automatically without any driver intervention.” Simply put, if your truck is driving at high enough speeds, it should be able to automatically regenerate the DPF. When a truck is not able to reach the required temperature for passive regeneration, the driver must manually initiate the DPF’s regeneration process by pushing a button on the dash. This requires the truck to be parked and can take at least 20 minutes to a half hour to complete. If the indicator was missed to regenerate the DPF, the DPF would need to be forced regenerated by a mechanic or entirely replaced, costing upwards of $1000. By installing a truck mounted generator on your TMA truck, you can entirely avoid have your engine on, thus avoiding build up in your diesel particulate filter. The generator can power all of the auxiliary lighting and accessories on the truck, making their no need to run the truck’s engine unless you are moving. The truck mounted generator allows you to avoid time consuming active, or manual, regens, saving you time and potentially money. 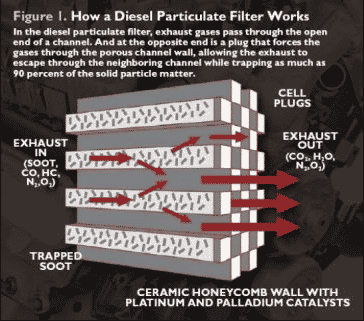 Why do DPF filters get blocked up? Like any filter, blockages can happen for a multitude of reasons. Some of the reasons your DPF may be blocked are the rate soot is released, oil or fuel quality, driving style, and the location of the filter. Wear and tear is normal on any frequently used piece of equipment, but cleaning it regularly using the methods above and attaching a generator will keep it working as it should, and prolong its life. Do you know your state’s anti-idling laws? In most states, there are rules and regulations on how long you can idle without getting heavily fined. For example, California, the first state to enact idling regulations, it restricts idling time to no more than 5 minutes with a $300 minimum fine for violations. While this may seem like an inconvenience, it’s important to think of what millions of trucks idling and pumping harmful emissions into the air do to the environment of which they are working. Not only does idling emit Carbon Dioxide, the main culprit of the greenhouse effect, but more dangerous chemicals like Carbon Monoxide, volatile organic compounds (VOCs), and Nitrogen Oxides. This is where the Environmental Protection Agency stepped in with the regulations. States, municipalities, and other local agencies took this act seriously and created new anti-idling regulations. These range from allowing up to 5 minutes of idling to none at all. Check your states regulations via the Compendium of Idling Regulations from the American Transportation Research Initiative. If there are any questions this leaves unclear, feel free to comment below or email us, and we would be more than happy to further direct you to the answer. How does a generator reduce my idling time? Royal Innovative Solutions came up with a Smart Generator to solve a slue of idling and DPF filter problems. Since many operations require lights, tools, and other equipment that need a power source, we wanted to create a solution that made it possible to have these essential parts without draining your engine and breaking the idling laws. This truck mounted generator ties directly into your truck’s fuel supply and doesn’t deplete the tank by more than 20% to ensure you don’t run out of fuel. There’s even a gas and diesel version so it can help any kind of truck remain efficient and useful. It runs in 15 minute intervals and after that, if it sees the batteries are charged, it shuts off. If it senses it needs more, it’ll keep running. Now, THAT’S smart! This drastically cuts down on fuel supply – rather than running the generator straight through your operations, it will sense when it should be on and turn off. 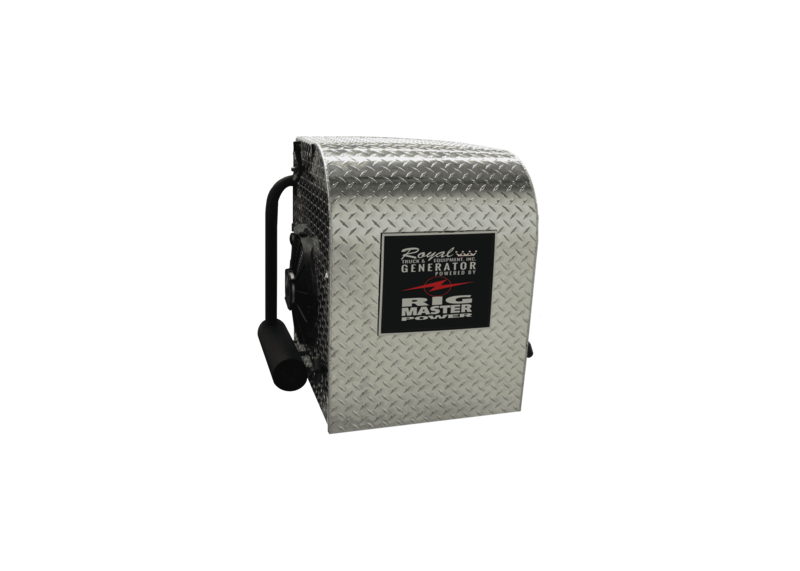 This eliminates the necessity for the truck to idle for hours at a time which leads to clogging the DPF filter and many other engine issues. This generator will power all your lights without draining the battery and engine. Your arrow boards, headlights, strobe lights, and work lights can all stay on with no worry. By adding a truck mounted generator to you truck, your company can save valuable time and money. In comparison to continuously running your truck’s engine to power your truck’s auxiliary lights, accessories, and tools, the generator can do all the same functions for a fraction of the cost in fuel consumption. Additionally, because the engine does not need to be running to serve as a power source, the diesel particulate filter will not need to be regenerated as often, saving you time and potentially money, in the case it needs to be replaced. Keep your work zones efficient and productive, and avoid idling fines, with a truck mounted generator. It is no secret that highway work is not safe. With deaths happening in approx. 1.8 work zones everyday across America, something has to change. New training methods have changed how companies operate, and save lives.